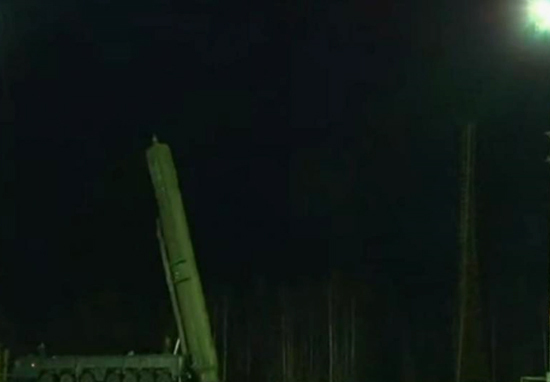 Russia has carried out a test launch of its Satan 2 nuclear missile weapon, according to the Russian defence minister. Also known as RS-28 Sarmat, the missile was launched from the Plestek Cosmodrome spaceport, 500 miles north away from the city of Moscow. The rocket travelled for 3,600 miles, hitting a target at the Kura test range. This range is an intercontinental ballistic missile impact area located in the far east of Russia. It is believed this weapon has the capacity to hold twelve nuclear warheads, and possesses the potential to wipe out an entire country with just one strike. Furthermore, as part of the drills to test out Russia’s nuclear weapons arsenal, three ballistic missiles were launched from nuclear submarines. Kremlin officials claim President Vladimir Putin himself launched four of the missiles personally. According to reports, Putin carries a ‘nuclear briefcase’ with him – complete with a launch system – wherever he goes. The defence ministry has stated the country had ‘carried out an exercise to manage its strategic forces’, adding ‘all objectives of the training have been successfully completed’. Concerns among members of the international community were raised earlier this month after Russia carried out test exercises which involved the use of intercontinental ballistic missile launchers. Large scale war games were carried out only last month, administered by Russia and Belarus.